Help Toni Get a Lung Transplant! Thomasena (Toni) Somerville Ebron, needs a lifesaving lung transplant. In October 2015, Toni was diagnosed with a rare end-stage interstitial lung disease and her breathing rapidly deteriorated within about five months. 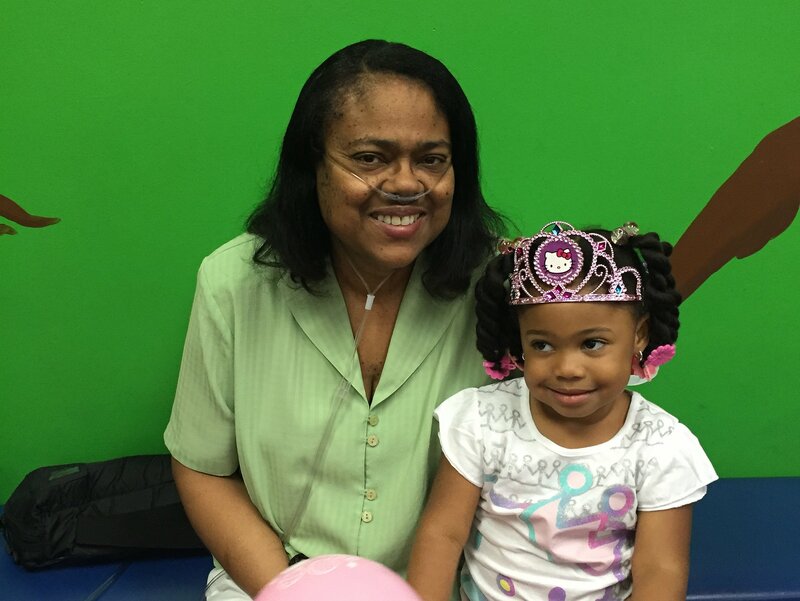 A lung transplant will give her hope to have more years to spend time enjoying her two grandchildren, other family members and a host of supportive friends. Toni, as she is affectionately called, is the wife of Willie and mother of Wilton and Wynnaea. She attended Philadelphia High School for Girls (Class 214), John Dickinson College, and The Wharton School at the University of Pennsylvania. Following her retirement from IBM after 33 years, she supported a family business, served as secondary caregiver for her mother during the last year of her life, and helped care for her granddaughter for two years. Toni has been a member of St. Matthew’s Baptist Church in Williamstown, NJ for 23 years and serves in leadership roles for the Deaconess, Women’s Retreat and Sunday School ministries. Transplants are lifesaving but financially overwhelming. Even with insurance, the out-of-pocket costs for a transplant are very expensive. These costs include high co-pays, coinsurance, doctor visits, lab tests and numerous anti-rejection medications she will have to take for the rest of her life. Two recently prescribed medications cost over $1,000 per month and many more medicines will be added after transplant. In addition to praying for Toni, many family and friends have asked how they can help Toni financially. To help offset these expenses, a fundraising campaign in Toni’s honor has been established with Help Hope Live. To make a tax-deductible donation, click on the Donate Now button. Thank you for your prayers, generosity and support. On April 15th, Toni received a double lung transplant and is recovering well. She has been sitting up in a chair the last two days and she even went for a short walk outside of her room today. Please pray that she has a full recovery, no rejection of the lungs and no major side effects. She is grateful for all of the prayers, love, support, gifts and donations that she has received. May you continue to heal as God blesses you. You remain in our thoughts and prayers. Praise God from Whom all blessings flow!!! So happy for you and your family that you got the call you were waiting for! Love you Toni. God's many blesses I wish and pray for you Sis. The Lord God in the midst of you is mighty! - Zeph 3:17. We look to Jesus, the Author and Finisher of our faith. We agree with you in prayer and expect a miracle from the Miraculous God Who loves you and is Jehovah Ropha, The Healer. We know that our God is able and can accomplish anything! Stay strong in the Lord! We are praying! Lifting you in ernest prayer. Our God is a healer. Stay encouraged. God Bless You Toni! We love you and are praying for you. God is a healer. Continue to be strong in the Lord and in ever increasing faith in Him. Dearest Toni, Praying for you my dear friend and Sister-in-Christ! Our God is faithful and will bring you through this challenge, too! Love you! God bless you Toni, you are always in my prayers. We love you!! Praying for you always, my dear friend. Cliff and I are praying for you. Be encouraged. We are just human but we serve a mighty God. He knows our frame. He is holding you in His Hands and will continue to endure the trials ahead. We love you. Happy belated birthday Aunt Toni! We are praying and believing God for your healing, health, and happiness! Happy Birthday Toni !! Praying for you. Love you !! Happy Birthday Toni...thinking/praying for you. Hey Toni, praying for you & Happy B'day! My Dear Toni you are a true servant of the Lord. You are a dedicated, loving and caring vessel. I love you and will continue to lift you up to our savior. Be encouraged! Toni, Be encouraged. You have been an inspiration to me and my family for so many years. Thank you for your wise and gentle counsel. I love you. Toni, prayer with and for you. Trusting & believing God at His word which is full of promises for His own. Love yah! Toni, Sending you love, light and positive, healing energy during this challenge. God is giving you a testimony so that you can testify to others after you win this battle. Stay strong and hold on to your faith! Hi Toni! I have been missing your smiling face at SMBC. Stay encouraged, our God is a healer! I will be looking for you back at church soon. Love you! Hi Toni, Be encouraged, our God is a Healer! I love you, and I am praying, trusting, and believing you will be healed! In the name of Jesus! Amen. Good Bless You Sis Ebron! I am praying for you! cousin toni... many family and friends wish you the very best..we are with you!! take care. Our God is Awesome Mrs. Toni! He is able to carry you through this! We love you and your family and our prayers are with you!!! Keeping your beautiful Mom lifted in prayer Wynnea.